Protects hands from fatigue and irritation, while adding a traditional touch. Provides supreme protection while being thin to allow maximum grip and flexibility. Can also be used as gym exercise weight lifting glove, cycling gloves, fitness gloves, etc. Made with top quality full grain genuine sheepskin leather. Enjoy the luxurious natural, soft and supple feel. Features knuckle holes and wrist strap with snap, for easy on-and-off. The Bleu Nero Men's Driving Gloves are unlined and perforated to allow breathability and an ultra-comfortable experience. Perfect driving gloves for winter and summer. Thumb and two fingers are touch-screen, enables using a mobile phone while wearing the driving gloves. PREMIUM QUALITY - Made with top quality full grain genuine sheepskin leather. Enjoy the luxurious natural, soft and supple feel. Features knuckle holes and wrist strap with snap, for easy on-and-off. 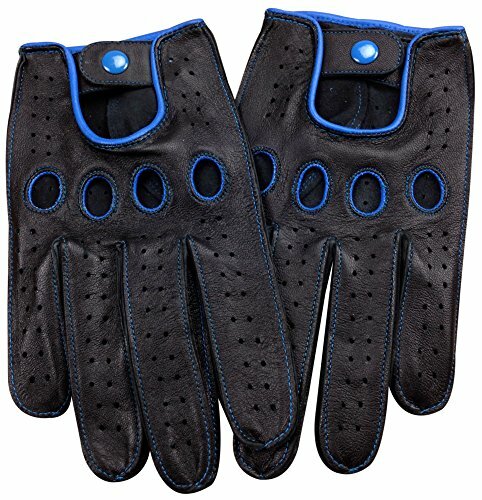 PERFECT FOR ALL YEAR - The Bleu Nero Men's Driving Gloves are unlined and perforated to allow breathability and an ultra-comfortable experience. Perfect driving gloves for winter and summer. AMAZINGLY SOFT & FLEXIBLE - Protects hands from fatigue and irritation, while adding a traditional touch. Provides supreme protection while being thin to allow maximum grip and flexibility. Can also be used as gym exercise weight lifting glove, cycling gloves, fitness gloves, etc. DURABLE - Bleu Nero Driving Gloves are made with selective high-quality nappa sheepskin leather, perfectly tanned and sewn with perfection. Long lasting performance and endurance. TOUCH SCREEN - Thumb and two fingers are touch-screen, enables using a mobile phone while wearing the driving gloves. If you have any questions about this product by Livativ, contact us by completing and submitting the form below. If you are looking for a specif part number, please include it with your message.